Thursday night was the end of my working week and I was feeling exhausted, both physically and emotionally. I decided to take matters into my own hands and sent a call out to my close friends for them to join me the next afternoon for Friday afternoon drinks after the school bus pick up. It gave me an excuse to get in and clean my house, to catch up and recharge with my friends and have a few nice glasses of wine. What I was not expecting was the 3 unwelcome visitors, that chose that inopportune time to come visiting. 3 brown snakes in varying size and shades of brown, but equally scary and all had me shaking in my boots, let alone worried for the safety of the 12 kids, 2 babies and 5 adults who'd responded to my drinks call! The Muddy Organiser had eagle eyes and spotted the first one, this one we dispatched out of the house yard with Oranges (they were the closest weapon), it took off for a pile of sticks, and even had a gnaw on one of the Oranges on the way. Out next visitor was a little bit bigger, and came sliding across the veggie patch, under the swings and headed for the outdoor setting, we herded the kids inside and we sent this one on it's way with an empty wine bottle, some bricks and a vehicle attempt to scare it. Just as we thought the scare was over, the final visitor popped into the house yard, he must have been the Daddy one because he was the biggest, he got the message and headed off to find a hole to camp up in. I am by no means a snake wrangler, in fact I am as far from it as you can possibly get. They strike fear into my heart and almost make me wet my pants. I am continually reminded though that they are part and parcel of living where we live. I have accepted them as part and parcel, I can generally cope with one snake visiting the house yard at a time, but 3 in a very short space of time scares the crap out of me and makes me on edge. You need eagle eyes and the Muddy Kids aren't let out of my sight at the moment. Muddy Hubby has always said 'They're the most active in October' as they're coming out of hibernation and looking for some loving. I sure hope they're satisfied soon and don't feel the need to use my house yard as their meeting place for much longer! Maybe they were coming for the wine to get them in the mood for some lovin'. You are on brave woman, don't think I would have been coping. Trust you had a few wines to settle the nerves. Oh, wow! I don't even know how I would be able to deal with one!!! I hope for your sake, the end of October comes without anymore unwanted visitors! Thats amazing - 3 in one afternoon!! I know we have to live with them, but I am like you - they are fine if they keep to their territory and stay out of yours! Even here in the middle of suburbia, we get a lot of snakes. How unlucky that the unwanted guests(and 3 of them! )decided to come while you had invited ones as well. Lucky there was wine! I am always a little uneasy as the weather warms up as even though I live in town it is a very rural one and snakes are part and parcel of life here too! Wow - I would have needed more than just a few glasses of wine after a scare like that. 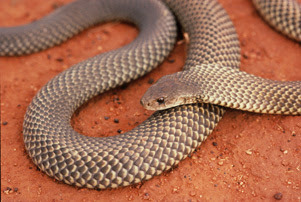 I just hope mum and dad snakes don't have a trillion snake babies around your yard! Do you have any friends left?..hehe! Wow. I could not handle three snakes in a row! We are spending our first summer in our current house and have been told there are a lot of brown snakes that come up from the creek. I crap myself every time I go outside with the boys.